As promised, we are using up leftover lentils today. No leftover lentils? Go start a pot of the little French ones now. Cover a cup of them with water, toss in a bay leaf, they’ll be ready before your remaining ingredients are chopped. Which brings us to the next point: this is a more time-consuming recipe than most that I post on this site. You may not want to start cooking these at 6 p.m. on a weekday–but then again, you might. Who am I to insist that you eat before 7? If you’re looking for a “center of the plate” vegetarian main course, look no further. One or two of these golden cakes, anointed with a dollop of herby yogurt sauce, makes an elegant entree. At the same time, nobody could blame you for popping one of these into a hamburger bun and piling it with crunchy lettuce and tomatoes. The perfect vegetarian burger is an elusive thing, but these fit the bill: flavorful, moist, and sturdy enough to pick up in your hand. This recipe is adapted from the blog Coconut and Quinoa, so all the credit goes to Amy for the little touches that make this recipe work: mashed chickpeas and oat flour to bind the patties without egg, a sauteed grated zucchini for moisture, and piles of herbs, capers, and a spash of balsamic vinegar to brighten and enhance the flavor of the earthy lentils. French Lentil Cakes with Yogurt and Fresh Herbs: In large bowl, mash 1 1/2 c. cooked chickpeas. Saute a finely-chopped red onion until browned, adding 6 minced cloves of garlic near the end of the cooking time. Scoop the onions and garlic into the chickpea mash. In the same pan, saute a grated zucchini for 2-3 minutes to wilt it, then add that to the bowl as well. Pulse 1/2 c. rolled oats in a food processor to make oat flour (or, hey, if you have oat flour already–you know what to do). Add oat flour to the bowl along with 3 Tbsp. chopped capers, 1/2 c. each chopped fresh parsley, cilantro, and dill (or whatever combination you have handy), 2 Tb. chopped mint and 1 Tb. balsamic vinegar. Add 1 1/2 c. cooked lentils and stir everything up, then season to taste with salt and pepper. Line a baking sheet with parchment paper smeared with a bit of olive oil. Use your hands or a measuring cup to form 1/3-cup cakes, patting them together firmly. (You can put them in the fridge at this point until you are ready to bake them.) Brush the tops and sides of the cakes with a little more olive oil. Bake at 375 for 20-25 minutes. Serve them upside down (isn’t that smart? That’s Amy’s tip too), since the bottoms will be more attractive than the tops. 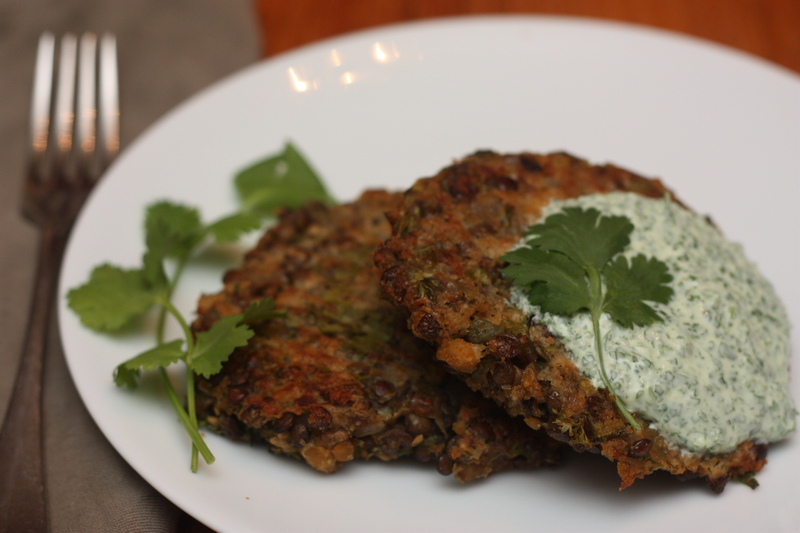 I served them with my favorite yogurt-cilantro sauce, but I’m sure Amy’s yogurt-mint sauce is delicious as well. This entry was posted in Beans and Other Legumes, Cakes, Food, Recipes, Vegan or Would-Be-Just-As-Good-Vegan and tagged cooking, dinner, DIY, family, healthy, homemade, lifestyle, recipes, vegan, vegetarian on May 30, 2012 by emmycooks. Those look really, really good! I’m very impressed indeed. I adore lentil cakes/burgers so much. how kind of you to help me answer the question “what vegetarian entree will you bring to our potluck next week?”! These sound delicious–a major step up from what is commonly passed off as a vegetable burger! Those look pretty delish!! I’ve just stocked up on lentils this past weekend. I am all over this or some Confluent-y type similar concoction! I just love French lentils, and these look awesome! Looking SUPER delicious Emmy! 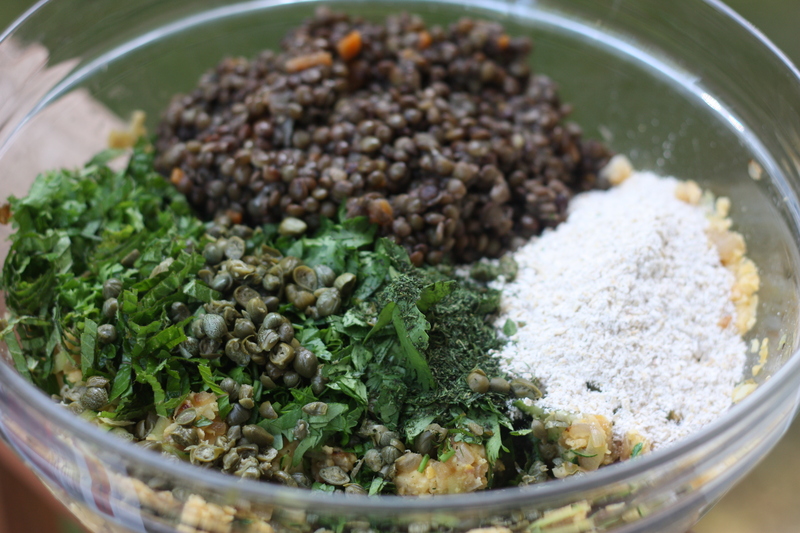 :) I love fritters and you can never have too many french lentils! I don’t know how you do it, Emmy, but you keep posting recipes that I simply must try! I adore lentils and have a braised lentil dish that makes a great lunch for work. But these cakes look like they take lentils to the next level. A level I want to achieve. Soon, I hope! This looks like the best lentil cakes ever! Really yummy. At first, I thought that they might be like Heidi Swanson’s quinoa cakes, but the binders here are so innovative. Really looks amazing. Thanks, Emmy! Mmmm! These look so good and I am happy to see them baked, not fried. I love French Green Lentils, they are my favorites. I might just give these a try tomorrow. Thanks! Fantastic idea! We love beans in all their forms, especially fast-acting lentils…they allow for so much spontaneity!!!! Thanks for this terrific inspiration! Those look fantastic. 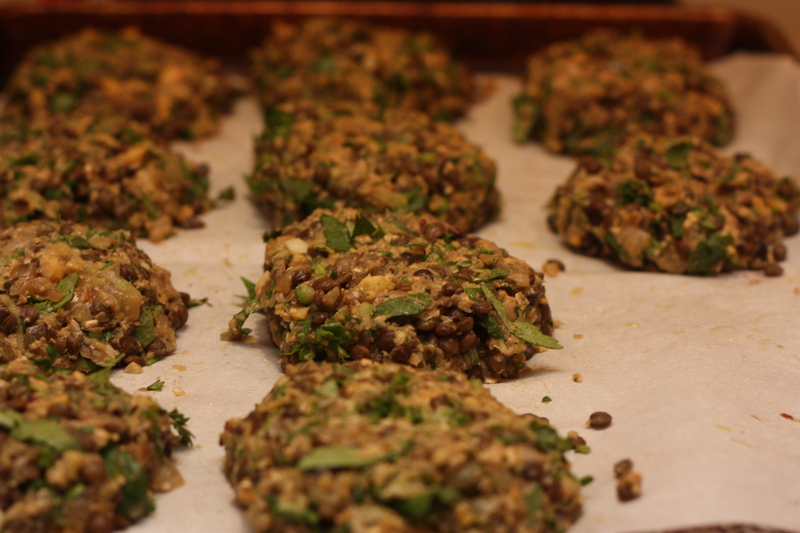 We make a lot of lentil based “cakes” and appetizers. I love the flavor combos in yours. I love lentils, but somehow I’ve never gotten around to trying lentil cakes. These sound lovely and easy too. Love the notion of adding capers! Yum. I don’t like veggie burgers, but I love lentils. Super fancy!